'Felix Dodds is the Milo Minderbinder of the stakeholder world!' Alex Kirby, BBC 'An invaluable tool for anyone wishing to understand and contribute effectively to the competition of good ideas that intergovernmental meetings should be' Paul Hohnen, former Strategic Director, Greenpeace International '...the book is a valuable resource for people willing to understand the practice of international negotiation and for those preparing to be influential negotiators.' Political Studies Review Organizations spend considerable resources taking staff to international meetings, often without understanding how these meetings work. 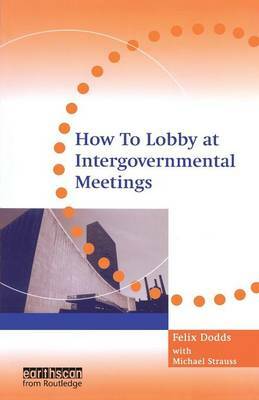 This book is a unique guide on how to participate and be heard at intergovernmental meetings, whether as a stakeholder or a government official. It contains a wealth of essential reference material including tips for navigating the intergovernmental hot spots of New York and Geneva, lists of UN commissions, conferences and permanent missions, contact details of key international organizations, NGOs and stakeholder groups and useful web addresses. If you have never lobbied or just want to have a better understanding of how the intergovernmental governance process works, this book is the essential resource to make your work much easier.